Show your ticket to any New Zealand Festival event when you purchase a main and receive a free Affogato dessert of Espresso coffee, Frangelico liquor, biscotti and ice cream. 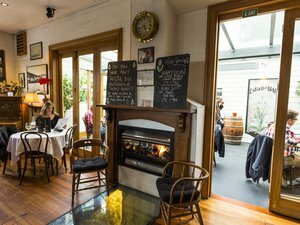 We have been serving wonderful people such as you for the last 176 years, including Te Rauparaha, the great Maori Warrior & Katherine Mansfield the famous modernist short story writer. Experience first class dishes, excellent wine and first class service.